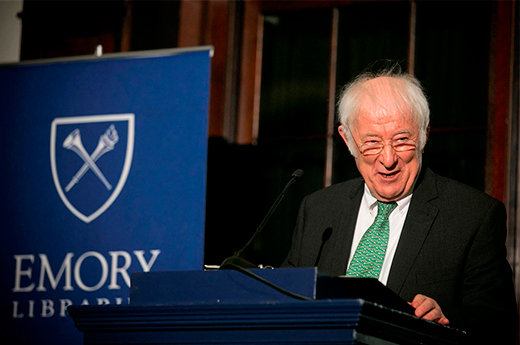 Irish poet Seamus Heaney reads his poetry at an Emory University event in March 2013. Credit: Emory University Photo/Video. Irish poet Seamus Heaney is shown addressing a crowd before reading his poetry on the Emory University campus in March 2013. Credit: Emory University Photo/Video. Irish poet Seamus Heaney, photographed at Emory University in March 2013 by Bryan Meltz of Emory University Photo/Video. 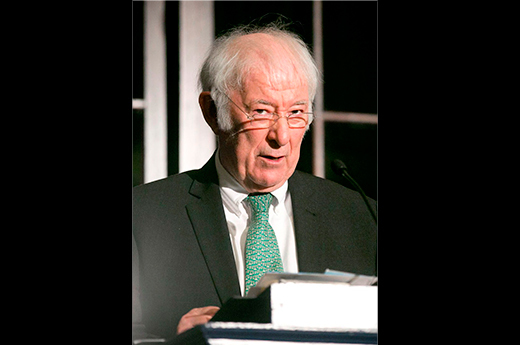 The Oxford College Library will bring a condensed version of "Seamus Heaney: The Music of What Happens," the immensely popular exhibition about the late Irish poet held at the Emory University's Robert W. Woodruff Library in 2014, to the Oxford community. The exhibit will open Aug.10 in the Oxford library's Fran Elizer Exhibit Gallery on level 1. Among the items on display will be Heaney's writing desk, several editions of his poetry and other works, drafts of his writings that demonstrate his creative process, photographs, and correspondence between Heaney and fellow poet Ted Hughes. Most of the materials are drawn from the Seamus Heaney papers and related collections held by the Manuscript, Archives, and Rare Book Library (MARBL) at Emory. The distinctive large kite that was created for the 2014 exhibition, a nod to Heaney's poems about kites, will be suspended over the Oxford library's main floor. A video program of Heaney and other notable poets reading Heaney's work, including Emory's Natasha Trethewey and Kevin Young, appears at the beginning of the exhibition. Another video shows curator Geraldine Higgins, director of Emory's Irish Studies program and a Heaney friend, giving a tour of the 2014 exhibition. Heaney was known for his open, welcoming personality, and the Oxford library and exhibitions teams are working to make that spirit come through in the exhibit as a celebration of Heaney's life and work, says library exhibitions manager Kathy Dixson. "It's a wonderful opportunity to share Seamus Heaney and his gregarious spirit with a new audience," Dixson says. "We see the exhibit as a celebration not only of his life and his work, but also of his longstanding relationship with Emory and the people here." 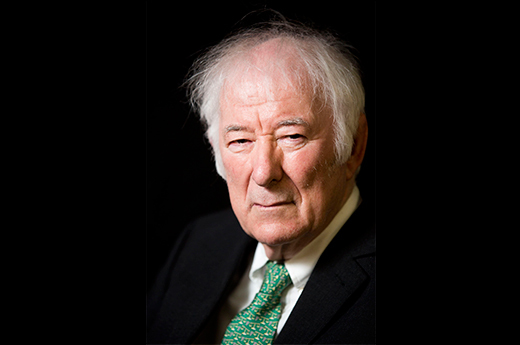 Heaney read his poetry at Emory and held workshops for students multiple times, from his first visit in 1981 to his last reading in March 2013, resulting in friendships with faculty and administrators. "I hope that, through this exhibit, students and members of the community get a sense of the depth of the collections that the Emory Libraries hold, and the global relationships that Emory University has," says Ellen Neufeld, assistant college librarian of collection management at the Oxford library. "We want our students to know what resources are available to them at Emory's libraries." Organizers plan to host a public event related to the exhibit during its run, which will end in May 2016; more information will be announced at a later date. The exhibit will be open to the campus and community at no charge during Oxford's regular library hours. More information is available at Oxford College Library. The Oxford College Library is located at 134 Few Cir., Oxford, GA, 30054.